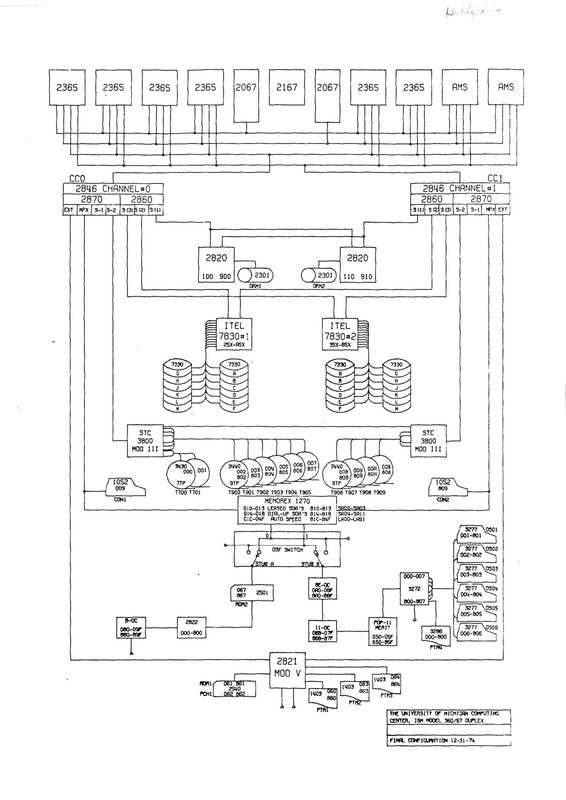 George Helffrich sent this diagram from 31 December 1974 of what was likely the final hardware configuration of the IBM S/360-67 (duplex) computer at the University of Michigan's academic Computing Center before the Model 67 was replaced by an IBM S/370-168. Cool. It may take a bit to figure out what all of those model numbers are. I never did anything with the 67 or the 370-168 that replaced it. The first system I touched with my own hands was the Amdahl 470V/6. Looks like the 67 only had two channels. I see the 2301 drums, ITEL 7330 disk drives (brand-x 3330s I'd guess), STC 3800 7 and 9-track mag tapes, two 1052 consoles (one for each CPU), some unit record equipment, and the Memorex 1270. It looks as if there is a bunch of stuff hooked up behind the 1270 and something called the DSF switch. That seems odd. Perhaps I'm reading the diagram wrong and everything is just daisy chained on the same multiplexor channels. There is more unit record equipment, PDP-8 and PDP-11 Data Concentrators, the Merit PDP-11 Communications Computer, and some 3270s. I wonder, did DSF stand for David Strong Flower? The DSF switch looks like something to allow some control units with just a single channel interface to be connected to either channel (or both?). It looks as if everything was connected to both channels. I wonder what the boxes labeled "AMS" are? Brand-X memory? I was able to de-skew the diagram a bit. .. and the resulting trembly lines, give it the appearance of the nearly forty year that have passed since it was drawn! and each 2870 had 2 selector subchannels in addition to the actual multiplexor channel. Confused yet? "the forked stick" and I think Mitch used to keep a wooden tree branch on top of it. AMS (Advanced Memory Systems) was indeed brand-x memory. it had none until the first Data Concentrator was built (much to IBM's annoyance). OK, I see, strung along after the Forked Stick, on stub A a 2501 reader and the original PDP-8 Data Concentrator. On stub B I see two more Data Concentrators (an 8E and a PDP-11, the Merit PDP-11 and the 3272 control unit. The 2822, which I didn't recognize, seems to be a paper tape reader control unit. Wow -- a /67 with a paper tape reader? I only thought DEC used those. Wonder why the unit record equipment (except the 2501) was attached to the "EXT" subchannel on the 2870? Seems to be distinct from the multiplexor and selector subchannels. I just looked at an FE document for the 2870. It suggests this might be the slower speed selector subchannel. Al Emery used to be the draughtsman for these Calcomp-plotted system configuration diagrams. He must have a complete program archive somewhere, and thus the whole chronicle of attached devices and configurations.